Walking is a widely preferred activity to attain physical fitness. 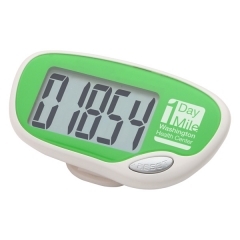 So a brand promotional gift like a custom easy read large screen pedometer will be received with great applause. These are big screen pedometers that count the steps up to 99,999. These step counts will be displayed on the large screen. The auto shut off and idle mode function makes it more energy saving. 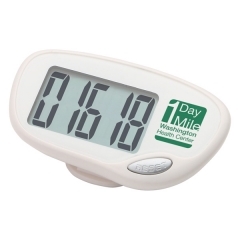 The promotional easy read large screen pedometer is made from ABS and PMMA. It measures 7/8” x 1-5/8” x 1-1/8” and provides sufficient space for brand imprint. 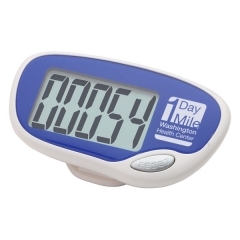 The personalized easy read large screen pedometer has a replaceable button cell battery inserted. Your customers definitely love these red step counters as they can help them to promote a better physique. Imprint Area : 0.5" x 0.625"
Product Size : 2-7/8" x 1-5/8" x 1-1/8"